Shoulder rehab after an injury will be slightly different for different types of injuries. Knowing what to expect from your rehab, and what kind of things you should be doing can help set your mind at ease. It will also help you make sure that you are covering all of your bases, and that your athletic trainer or physical therapist is not overlooking any component of the rehab process. Below are the major areas that should be evaluated and addressed with any type of shoulder rehabilitation. If you are missing one or more of these areas in your current knee rehab program, talk with your ATC or PT to find out why, and to make sure you are doing everything for your injury. Range of motion in the shoulder is paramount to normal function. If you can't move your shoulder, you can't do all of the things that life requires. Loss of motion is one of the primary complaints after shoulder injury or shoulder surgery. It is also one of the major obstacles during your rehab. Range of motion loss can usually be attributed to three main areas. Pain, muscle weakness, or capsular restrictions. 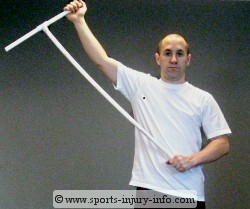 Your ATC or PT will be able to evaluate your shoulder motion and determine what is causing your restrictions. Pain is a major factor in shoulder range of motion. If your shoulder is painful, your body will do all that it can to prevent the pain. This usually means restricting your motion through muscle spasm. If your muscles are in spasm, especially the upper trapezius, deltoid, and rotator cuff, then it will be very difficult to move your shoulder through a full range. If you try to, it will usually increase your pain. 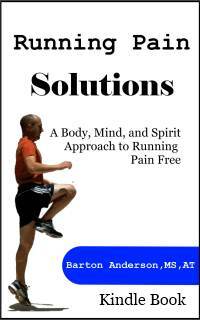 Pain can be addressed in many different ways. Hot and cold treatments, electrical stimulation, massage, positional release therapy, and low level joint mobilizations are all ways that pain can be treated. Most of these are performed during rehab by your ATC or PT. Muscle weakness may lead to shoulder motion loss. If the muscles are not strong enough to move the arm, you will not be able to achieve full motion. 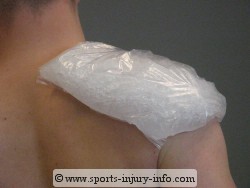 This is most common after shoulder surgery. Strengthening exercises focused on the rotator cuff, scapular stabilizers, and the deltoid will help to improve your strength and your range of motion. Capsular restrictions are the other factor that can lead to motion loss. This is common after surgery, but also after injury. Capsular restrictions may be in the form of excessive scar formation, or in adhesions between the different layers of tissues in the shoulder. Frozen shoulder is a common injury involving capsular restrictions. Shoulder rehab exercises to improve range of motion should include passive activities, assisted exercises, and strengthening. Range of motion exercises may be performed by your ATC or PT, or they may have you doing exercises on your own, like stick range of motion. Wall walks, and towel slides are other common exercises. Every good shoulder rehab program involves strengthening of the shoulder musculature. The shoulder is a very complex joint. It relies heavily on the muscles, especially the roator cuff and scapular stabilizers in order to function properly and remain stable. All of these muscles must be strong enough to do their specific job. If they are not, you will have compensations, leading to pain or other problems. Shoulder rehab exercises should focus on strengthening all four of the rotator cuff muscles, the scapular stabilizers, as well as the core and lower back muscles. Mobility is looked at in a different light than range of motion when talking about shoulder the shoulder. Mobility restrictions in the thoracic spine and the scapula will directly affect shoulder function, and your range of motion. Without proper thoracic extension and rotation, as well as scapular retraction and protraction, you cannot effectively use your shoulder. Your shoulder rehab program should involve some type of activities to improve your thoracic and scapular mobility, as well as your actual shoulder range of motion. Proprioception in the shoulder is extremely important. It is what allows the rotator cuff muscles and the scapular stabilizers to work together efficiently. Remember, proprioception is the communication between the muscles and the joints, and what allows you to be aware of your body position and movement. Shoulder rehab programs must incorporate all of the above areas in order to be successful. Make sure that you are covering all of these areas in your program to get the best overall result.